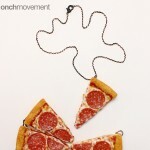 Dare To Wear Fried Chicken, Bacon And Pizza Jewelry By Onchmovement? 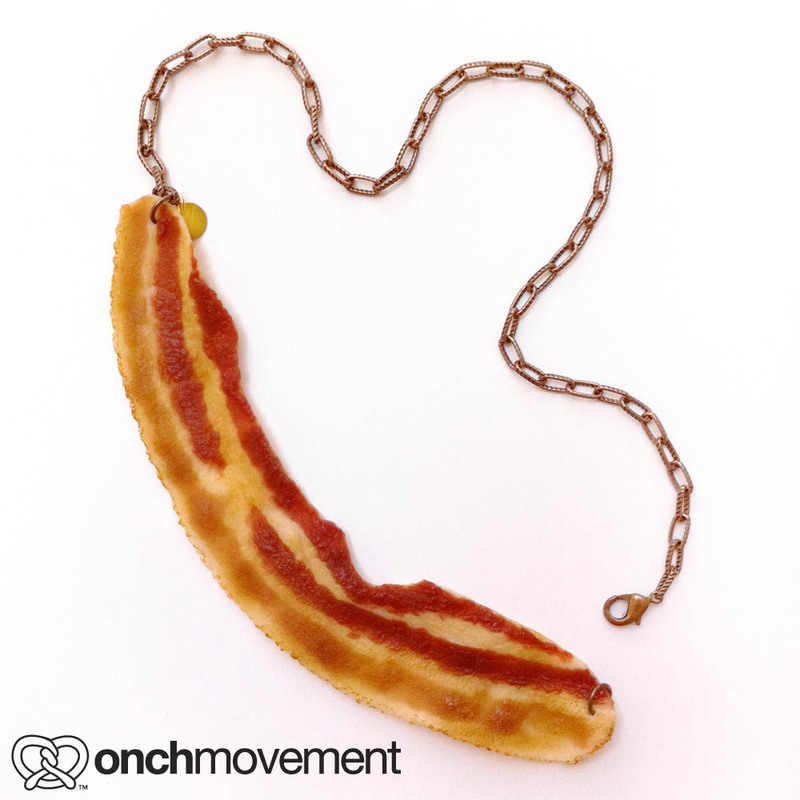 Stumbling across the Pink Fried Chicken necklace source, I’d though it would be a great idea to present you with the rest of the Onchmovement goodies! Literally. 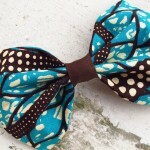 Maybe some of you appreciate and even want to wear (or imitate through DIY) the original creations? 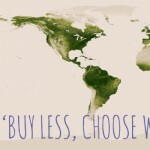 Why not, after all? More vehemently we try and deny Lady Gaga’s influence on fashion and things style, her attitude may be catching up with everyone. Lady Gaga wearing the infamous meat dress is still a burning image in my head and regardless of how much I want to reassure myself and believe it won’t happen again, Nicki Minaj sporting a golden chain necklace with a Pink Fried Chicken wing hanging on it is not a step in the right direction. Is it? 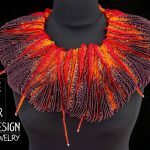 Onchmovement seem to be pretty serious about this kind of jewelry design. 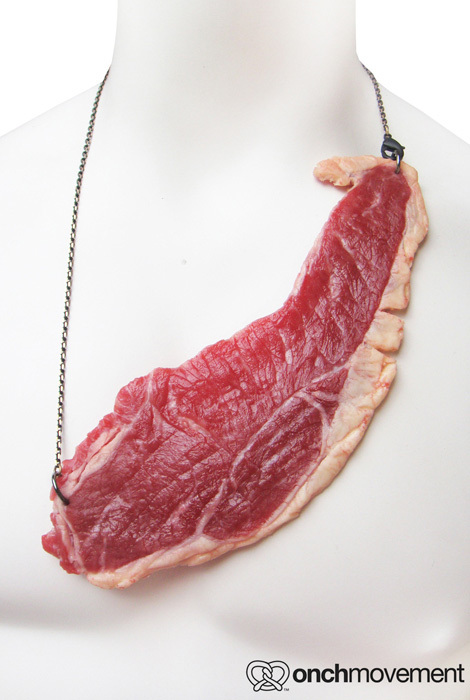 They’ve got a Pink Fried Chicken Drumstick Necklace and some Bacon Jewelry pieces too – check them out after the jump! The closest you can get of reproducing Nicki Minaj and her crazy pop look is by sporting the very same Chicken Wing necklace. 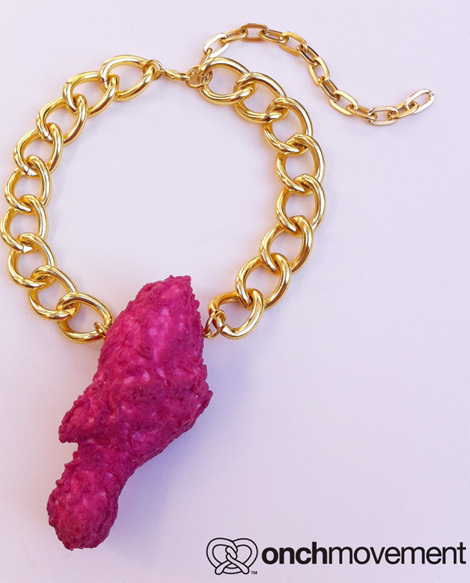 However, since the word is spreading fast around the internet and the said necklace is on sale, you may want to change your option and go for a Pink Deep Fried Chicken Drumstick Necklace. It’s the same price, also on sale: $79.99. If you’re a bacon fan, you’re lucky! 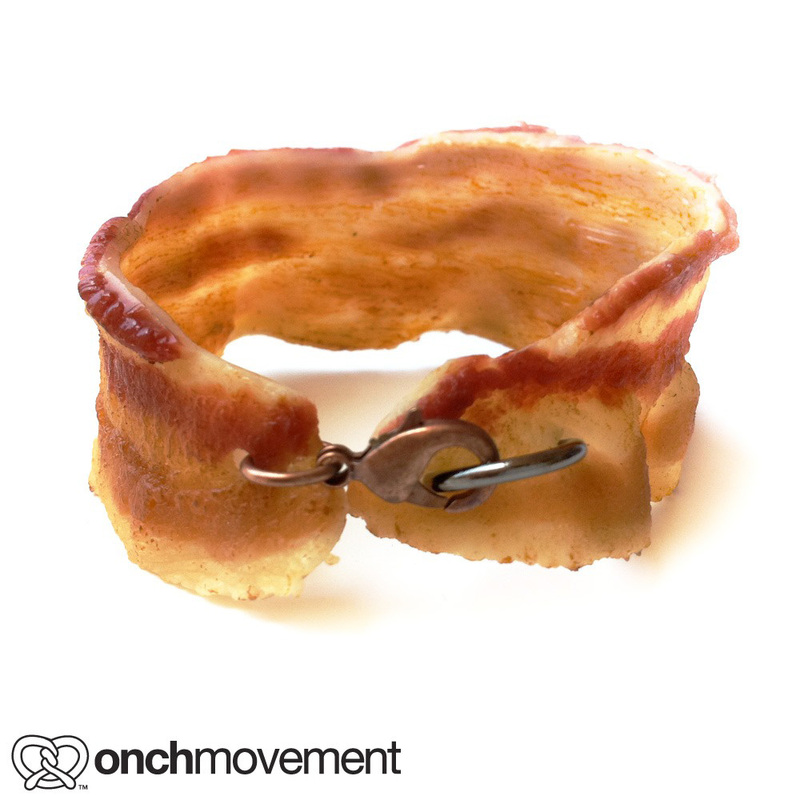 You can match your bacon necklace with a fancy bacon bracelet and consider yourself a vegan too. The bacon is actually handmade, 100% animal free material, sculpted and painted manually. The bracelet is $32 and the necklace is $36. 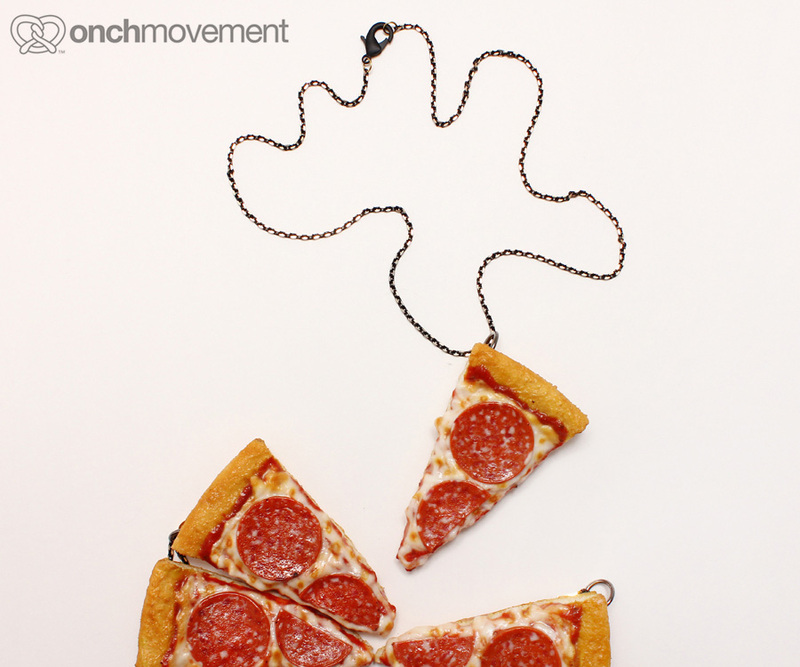 Also: if your guilty pleasure identifies in a slice of pizza, you can always declare yourself by wearing a $70 Pizza Necklace! 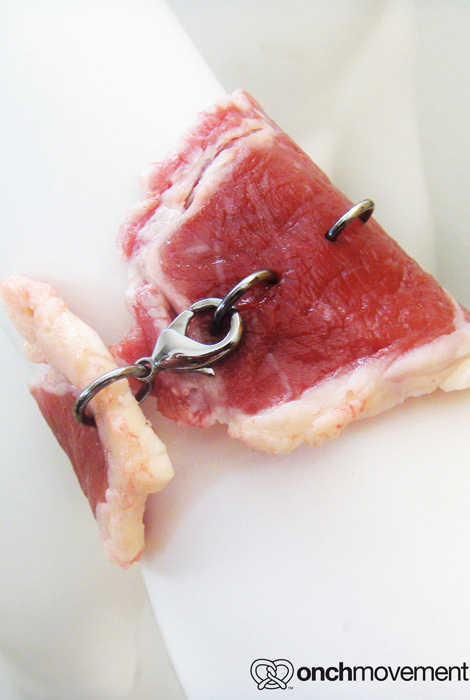 Oh, and as a special bonus, because you lasted this long: the Meat Necklace and the Meat Cuff! 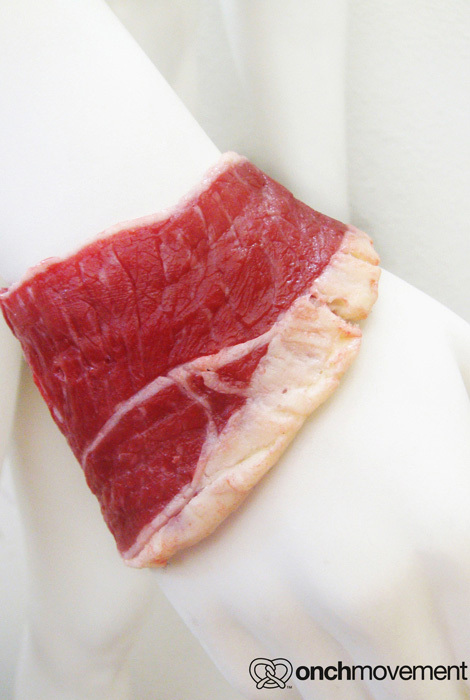 Yes, as inspired by Lady Gaga’s meat dress, the meat – lace necklace and its matching cuff are made from animal free material, also sculpted and painted manually. 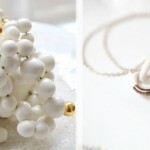 Both the necklace and the cuff can be yours for $70 each. Hungry much?